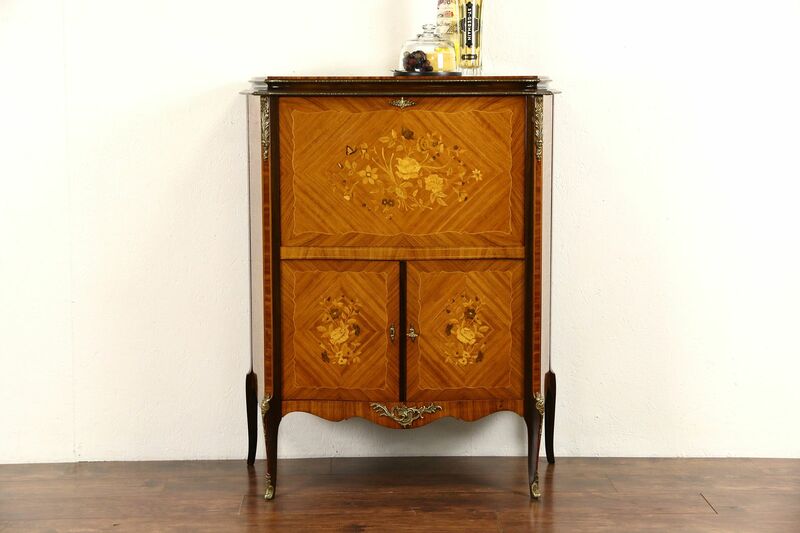 Hand crafted in Scandinavia about 50 years ago, this splendid bar is genuine rosewood with delicate inlaid marquetry of satinwood and other exotic species. The original polished finish is extremely well preserved with some fine scratches on the top, see photos. Gold plated mounts, moldings and working keys are original. Sides and front are gracefully curved. Inside are bronze toned mirrors and galleries for glasses with inlaid tulipwood banding. The serving area mirror has some silvering losses, see photos. The automatic xenon light has been rewired for US current on this exquisite European vintage furniture. Size is 38" wide, 17" deep and 46" tall.